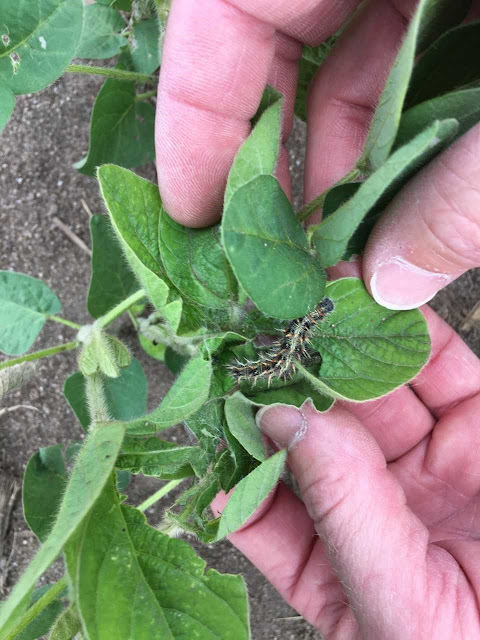 Generally speaking, thistle caterpillars are a minor concern for growers. However, they have been reported in soybeans across the Burrus territory this year. If a soybean field has small plants and the caterpillar population averages one insect for every other plant across the entire field, or if defoliation reaches 20-25%, then these pests should be a concern. Thistle caterpillars are mostly found in the leaves of soybean plants. They hatch and form webs by tying the leaves together with silk, creating a protected area for them to feed. After 2 to 4 weeks they form a chrysalis that hangs from the plant, and hatch after 7 to 10 days, emerging as a butterfly. Eggs: The thistle caterpillar eggs are light green and barrel shaped. Caterpillar: The body of the caterpillar is approximately 1 ¼" long and is black with yellow striping on both sides. It is covered with branched, spiny hairs. They are often found in webbed leaves where they feed. Adult (Butterfly): Upper portion of the front wings are red-orange and brown with black and white spots. The hind or lower wings are red-orange and brown with black “eye spots” along the edge. When the thistle caterpillar feeds on the leaves of the soybean plant, it causes defoliation in the upper canopy. If high concentrations are found in one area of the field, those places could be spot sprayed. 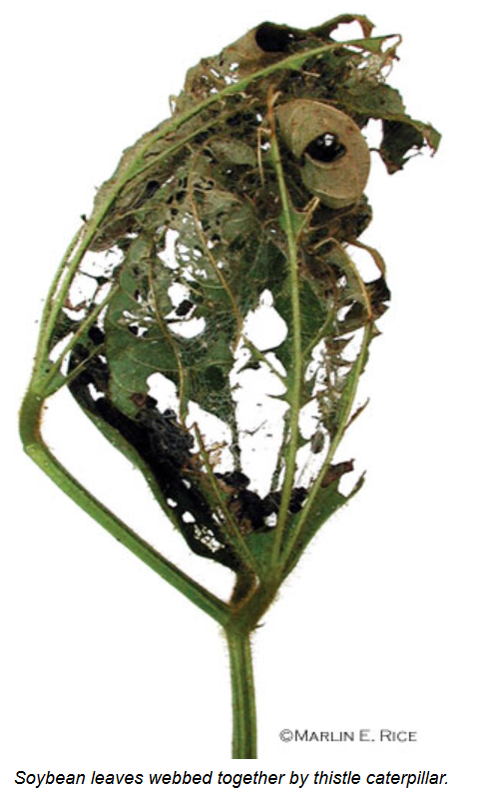 Labeled rates of insecticides can be used to manage thistle caterpillars. Koch, Robert, Suzanne Wold-Burkness. 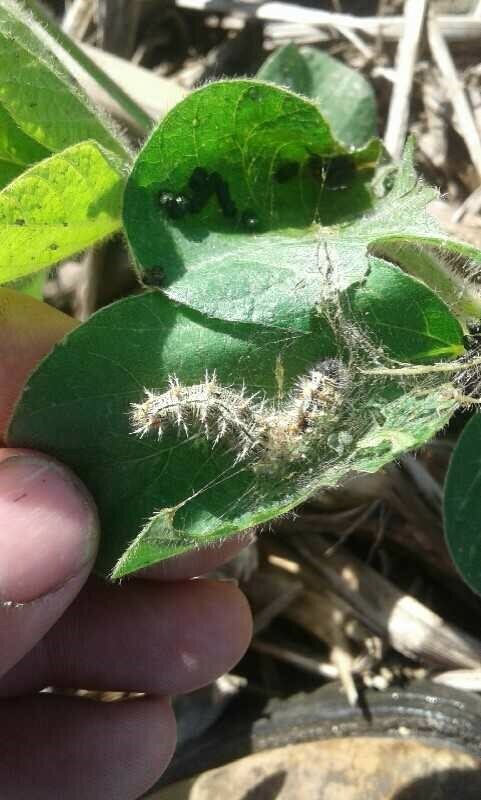 “Thistle Caterpillar in Minnesota Soybean.” University of Minnesota Extension, Crops Team. 2015. Rice, Martin E. “Thistle Caterpillar – Mostly Minor Pests of Soybeans.” Department of Entomology, IC-494 (15). 20 June 2005.